We have now reached Trinidad, so completing our grand plan for an East Caribbean circuit which we made back in February. However, we will leave news of this lively and beautiful island for the next update and finish the story of our three month stay in Venezuela which was without doubt the highlight of our voyage to date. It is a magnificent country of enormous natural resources, with friendly and helpful people but best of all, superb, remote anchorages. The marine life we have observed diving and snorkeling has exceeded, by far, anything we saw in the Caribbean island chain, in both variety and numbers. Sadly, in spite of it's enormous wealth of oil, minerals and hydro power, the vast majority of the people are desperately poor and becoming extremely impatient with a resulting, escalating security problem. It has been estimated that corrupt politicians and businessmen have salted away over $120 billion in the US over the years, mainly in Florida. The stories of personal risk are such that relatively few cruisers come here, those that do are richly rewarded by empty unspoilt vistas. Whilst moored in Puerta La Cruz, we managed to venture into the interior. First, a two flight trip via the capital city Caracas, to Merida, high in the Andes to the far southwest near the Columbian border. The flights were a great chance to see the vast savannah, mountains and amazing geological structure of the country. 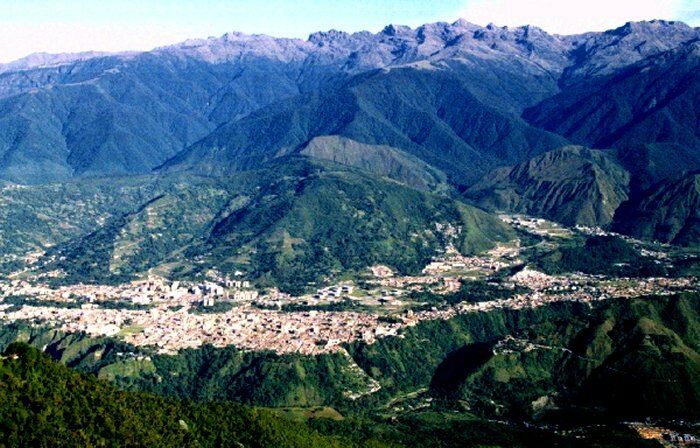 Merida is a university/tourist town occupying a long, flat plateau contained between two precipitous gorges at an altitude of around 1,700m (5,576ft). We spent a week walking and climbing our legs off in the breathtaking Andean scenery. The high point (literally) was a 12.5km trip up the world's longest teleferico (cable car) on Venezuela's highest peak, Pico Bolivar. Below is the view down over Merida as we climbed in four stages to 4,765m (15,630ft). Having been at around 2m above sea level for over a year, we sensed immediately that we needed some red cell acclimatisation. Nevertherless, we managed some modest climbing on the mountain, including a 620m (2,000ft) descent on foot at high altitude. The mainly volcanic rock and high altitude tropical flora reminded Dave very much of the year he spent climbing on Kilimanjaro. 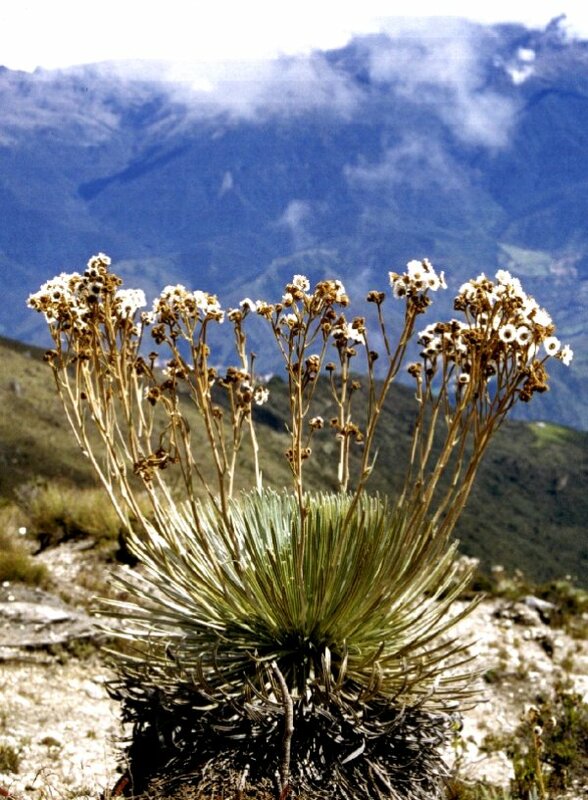 Here's a picture of some Andean flowers we saw on the way down. Merida is a charming old town built on a rigid matrix pattern that lends itself to browsing the busy narrow streets thronging with traders. Eating out was good too with lots of variety. We stayed in a small family run posada and got around the area in the cheap but scary buses. 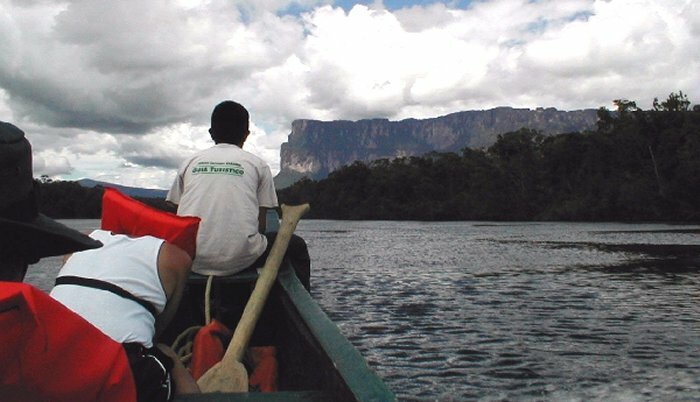 Our second trip was by small, seven seater aircraft to the Canaima National Park, beyond the Orinoco in the far southeast of the country. There were three boater couples (2Brits + 1US) plus Victor, our Venezuelan pilot. The approach was dramatic as huge tepuis rose from the plains like the lost worlds of an action packed jungle movie. 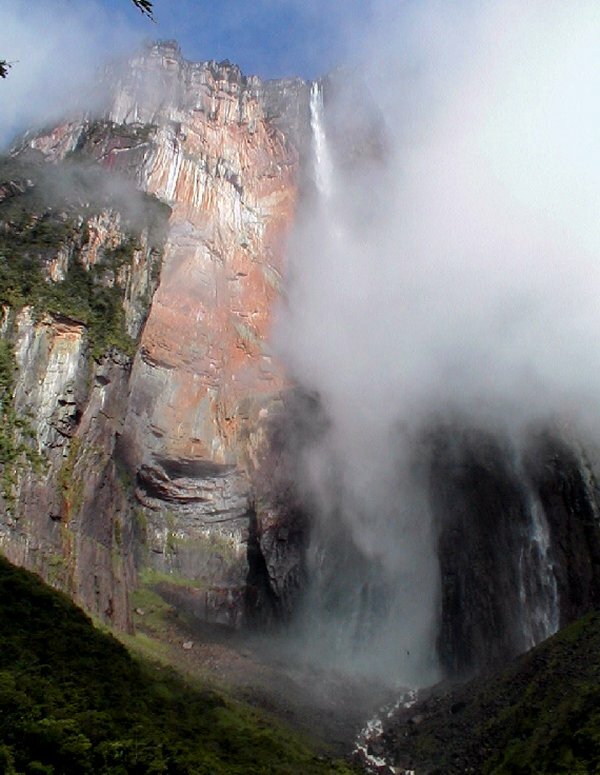 They are flat topped, sandstone outcrops that tower over 1000m (3300ft) above the forests, their copious waterfalls adding to the torrential flow of water down the many rivers. The El Sapo fall below was one of about five big ones close to the landing site. Suitably attired, we walked around 400m through the overhang under the fall; a noisy and wet experience. The El Sapo falls that we walked the length of, underneath !?!? Having survived this introduction we began the 48km (30mile) trip upstream in a Pemon Indian dugout canoe, fitted with a 40hp outboard. The picture below shows the languid waters of the lower reaches. Later we encountered over twenty serious white water rapids complete with shallows and rocks. As sailors, we were all quite happy with the limited stability of the round bottomed (tree shaped) hull and frequent wettings but never could adjust to water that, no matter how viewed, was plainly uphill! Our destination was a camp by the river, at the very foot of the world's highest waterfall. at around 1,050m (3,444ft). The view below is the one we had from the back of our basic tin roofed shelter. It was an amazing site to wake up to. The night we spent there was our 35th wedding anniversary, so here we are enjoying the company of good friends in the midst of a jungle wilderness. 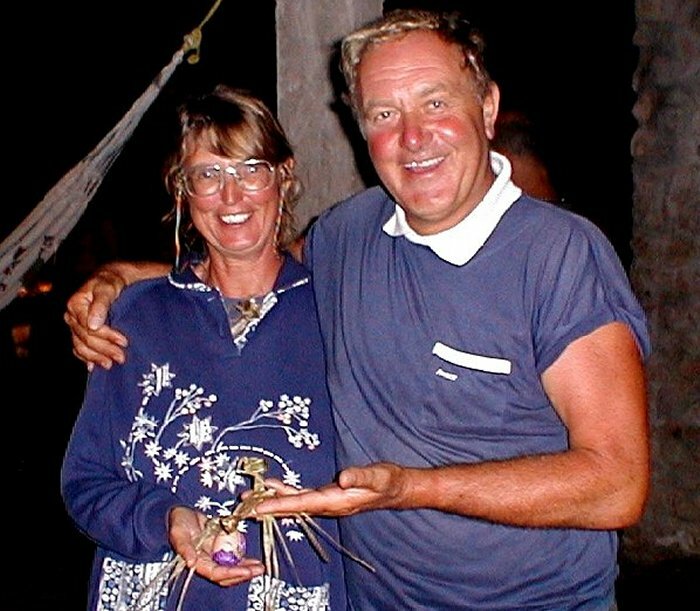 In our hands we hold the traditional Mexican tokens of this life event, painted sweet filled eggs and palm frond roses that our American friend Shirley produced. It will be an anniversary we will find it difficult to top. It rained heavily overnight which made for a noisy time as we lay in hammocks under the tin roof and also for lots of water in the falls and river which rose by around half a metre. The next day we had a fairly strenuous, four hour walk on rough jungle paths to the foot of the fall where again there was another white water swimming opportunity. The journey back downhill in the canoe was nothing other than a continuous three hour theme park ride. Wow, how we winced when we saw it in our video. 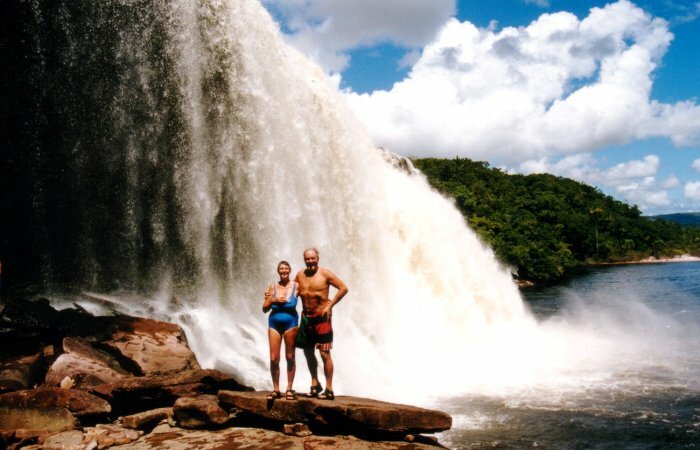 To cap off the trip we did a twenty minute overflight of the tepuis, canyons, falls and rivers that we had been such a part of for two days. After four weeks in Puerto La Cruz, our longest stay ever in one place, it was time to head slowly east through the inner islands and along the mainland towards Trinidad. Leaving was difficult as we had made so many close friends there in our socially active marina community. We left with our friends on Maffick whose company we enjoyed until they left to go to Margarita. 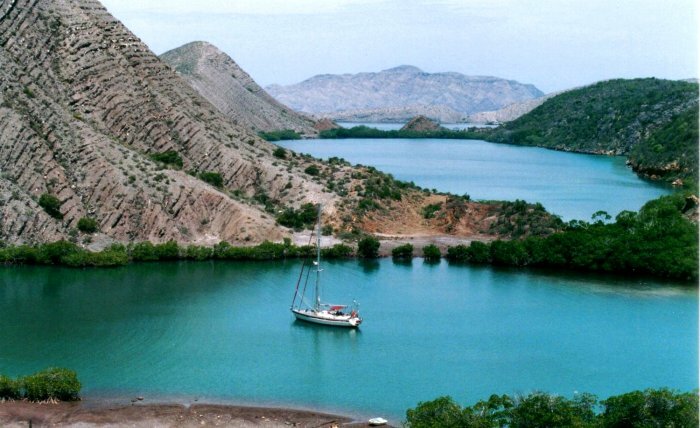 We eased our way back to sea again with a short sail to Borracha where the clear waters allowed us to swim off the boat again and assess the fouling that four weeks in port had produced. The antifouling we applied in the UK fifteen months ago has been almost totally depleted by the repeated scubbings of the last six months. The propeller was the worst with around 10mm of barnacles that needed to be sculptured off in stages. The refit in Trinidad will be hard work but at least the hull cleaning will be less a problem for a while. There are a string of inner islands leading along the coast eastwards and we called at most of them. This pool, deeply indented into the arid rocky hillsides of Chimana Grande afforded wonderful shelter coupled with a sparkling view of the lights of Puerta La Cruz, visible through the 100m wide gap leading out of the bay. Some had restaurants we could lunch at but all had superb anchorages in clear water with superb snorkeling over reefs rich in marine flora and fish. We came across Christmas Tree Worms for the first time in vast beds of colour just like a planted flower bed. Their fine spiral 'blossoms' come in around ten bright colours and can be induced to instantly collapse within their yellow tubular housing by a swift waft by hand or fin. 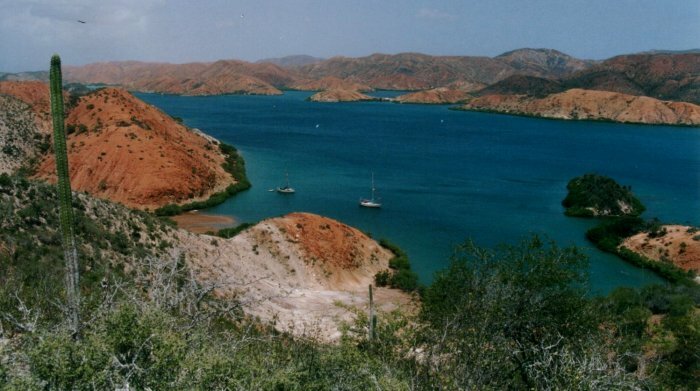 Another favourite was the 35 mile long Golfo de Cariaco with its many sheltered anchorages. The one above at Leguna Grande was immense with endless opportunities to find a quiet corner. The surrounding red hills proved too much of a temptation so several expeditions were mounted. The lower slopes are covered in dense cactus and thorn bush so it is best to navigate one of the many dry river beds. Higher up its just rock but steep and very loose. The views down into the gulf and out north over the sea to Coche and Margarita 20 miles away were superb. Real 360° video panning opportunities. Just up the coast we spent three days at a blues festival at Punta Cangrejo. It was a fairly informal affair, locally organised but lots of fun for the 20 or so boats that anchored in a small remote bay with a few Indian, round thatched chamizo shelters. It was also pretty select as there was no road access (or water, waste disposal or supplies for that matter). Again we leave you with a sunset. This from one of our anchorages on our way out to Trinidad, a long journey to windward, accomplished in overnight or early morning dashes under engine. All with diesel bought at 4.8p/ltr (22p/gal)!!!!! This area reminded us what an empty, inaccessible country it is, with its steep hillsides and mountains rising from the sea, clad in dense cactus bush, woodland or exotic tropical forest complete with bright coloured parrots and a sound backdrop courtesy of the howler monkeys. Here in Trinidad we are making the most of the three weeks before we haul Amoenitas out on 2nd October for a refit. It is a wonderful friendly place with masses to do and see. We are particularly looking forward to meeting up with many of our sailing friends we expect to be there and to seeing much of the diverse wildlife, particularly the birds. After the refit we plan to head out to Tobago for a few weeks, then on to Grenada and the Grenadines. That should see the hurricane season out and the start of our dash northwards, hopefully to Cuba and the Yucatan coast of Mexico. We haven't decided yet where to hole up next summer, it could be on the US Eastern Seaboard of back down in Trinidad. Either way we will be heading down for a Panama Canal transit early in 2002.